Cookie of the Month ~ Keep that sweet tooth happy! Need a unique customer gift idea? Cookie of the Month is the perfect solution. 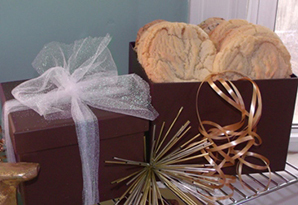 Who wouldn’t like to receive fresh, delicious, homemade cookies at their home every month? Our small batch, locally sourced, hand-scooped cookies weigh between 1.65 oz. – 2.25 oz. depending on the flavor. Check out our Cookie Page to get descriptions and ingredient information. You choose the diet style preference. Choose when to start deliveries.